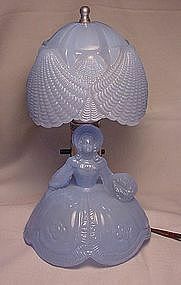 This figural glass lamp was produced by L.E. Smith Company during the 1940's - 50's. The color was fired on over clear glass, giving the opaque finish. This style is referred to as the 'Southern Belle' lamp. I have 2 available. Both have been re-wired so they work fine. The shade clips on the light bulb. (Bulb not included, I recommend 25 or 40 watt bulbs so the glass doesn't get too hot.) Please specify which you'd like. All are in good shape.